DOIs are in wide use to identify a published digital object, such as an article or a study, research reports and data sets. If you're accessing an article, you'll probably be forwarded to a reference service like JStor or ProQuest, and if your campus has a subscription with that service, you should be able to access the full text. In other words, DOIs also have built-in OpenURL functionality. DOIs are concise and easy to include in a citation and their adoption promotes access and reusability of data in modern research. DOIs are also part of an integrated network of linkages between articles and datasets that is maintained by publishers and repositories through registration agencies like CrossRef. The inclusion of DOIs in citations makes it much easier for your campus to see how a report or dataset generates other research, which in turn assists researchers in demonstrating the value and scientific impact of their work. 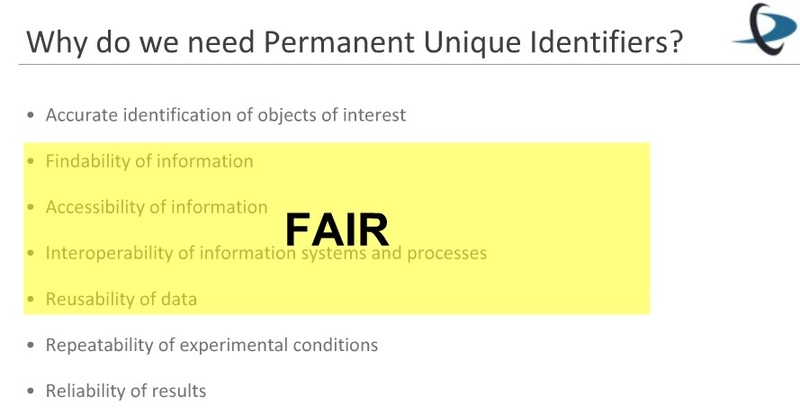 The webinar begins with some basic concepts on Permanent Unique Identifiers. Next, DOIs are introduced describing how they are managed, how they can be obtained and how their features can be of benefit to researchers in a wide range of fields. ... A number of referencing styles (including APA 6th, Chicago, and Vancouver) require that you include DOIs for publications where they have been assigned. This guarantees that others will be able to access your listed references, as DOIs offer persistence and permanence. To check if DOIs are used with your required referencing style, see e.g., University of Newcastle Library style guides. “How do I get a DOI for my survey? How do I demonstrate the impact of a study I've deposited with [YOUR INSTITUTION]? DOIs are used as Permanent Unique Identifiers (PUID) in the context of the Global Information System (GLIS) of Article 17 of the International Treaty on Plant Genetic Resources for Food and Agriculture (ITPGRFA).